The original 1974 Gone in 60 Seconds was the inspiration for the 2000 Nicholas Cage and Angelina Jolie hit of the very same title and is being touted in the press release as the godfather of car chase movies, and with good reason. And like all 70s American indie (and a good few studio) pictures worth their salt, it has something of a following, particularly with car enthusiasts, who get breathless at the range of class American cars that appear in the film. Gone and 60 Seconds follows top car thief Pace (played by director H.B. Halicki) and his crew as they find themselves entangled in a drug smuggling plot. Caught in the underworld of stealing and selling on sought after vehicles, Pace must lead his guys to freedom as they are chased ruthlessly by the police. This fast and furious high-speed hunt heats up resulting in the finale of cinemas’ greatest, and longest, ever car chase with the immense destruction of an incredible 93 vehicles over 40 blistering minutes. 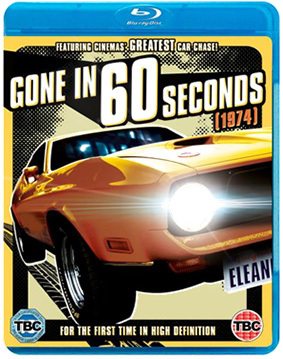 Gone in 60 Seconds will be released on DVD, and for the first time on Blu-ray by Kaleidoscope Home Entertainment on 20th May 2013 at the RRP of £15.99 for the Blu-ray and £9.99 for the DVD. Surprisingly, no extra features have been listed. If this is the case, it's a little disappointing for a Blu-ray release of a cult film from this era.